I did my fair share of music festivals when I was a kid - I fondly remember the Reading Rock Festival (the filth! the squalor! the cheap cider!) and Glastonbury was a blur of mud and poor sanitation. As I've grown up, so have the festivals - whereas in my youth they were a chance to escape the grown ups for a weekend, now the over 40s take their families. Now we can glamp in our luxury yurt, eating organic hummus and making occasional forays to the acoustic stage. I don't exaggerate either - a quick Google tells me that Latitude boasts an olive bar and a fruit and yoghurt stall. Cambridge Folk Festival has an onsite grocers. Glastonbury has over 250 food retailers, including silver service dining. Even Reading Festival offers organic meat (How things change - I fondly remember one year there we survived entirely on doughnuts, rather than eat the horse-n-gristle burgers). So you can see how this could be taken to a logical extreme. Why not remove the bands all together? No more loud music, louche popstars and leud twerking to upset the little ones. Just have the food stalls, but somehow make them the stars of show. I welcome you to Meatopia. 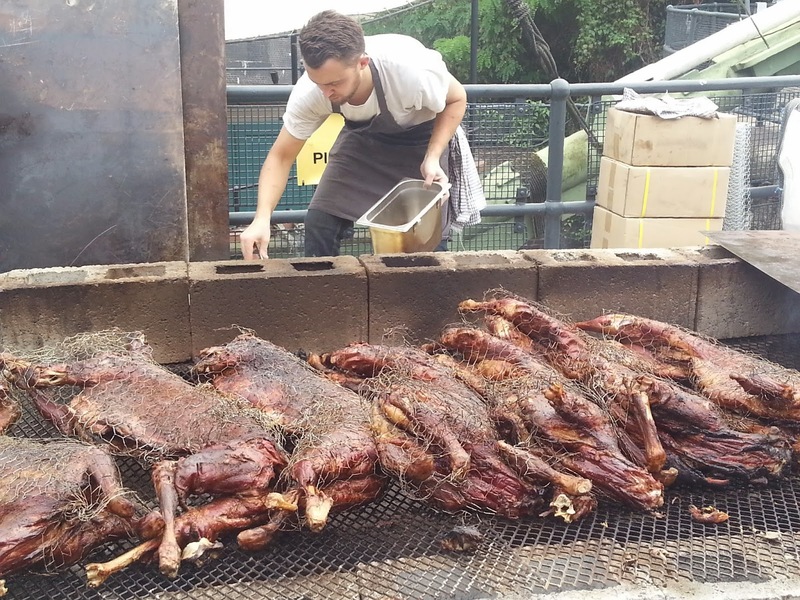 If Meatopia were a music festival, it's much more Donnington that Glastonbury. No hummus here, it's all about the meat. But many of the elements of a classic festival remain - there's smoke everywhere, but it's wood, not dry ice. There's a main stage, where the headline act for Saturday is an Italian butcher - and we cheered when he removed the hip bone from the cow carcass like we would a blistering guitar solo. We had our own rock god - DJ-BBQ, in his stars-and-stripes jumpsuit - as the day's MC. We even had some music - I particularly enjoyed the New York Brass Band's take on hits of the 80s and 90s - as well as guest DJs and piano sing-a-longs. But the meat was the main attraction, and boy was it good. We had twenty-two different chefs to choose from - each had just one dish that was to be cooked on a charcoal barbecue. Each dish cost one 'meatbuck' which could be bought for £5. So I had 4 bucks to spend, and was almost paralysed with choice. Do I want lamb cutlets? pulled pork? pork belly? cheddar dog? How can you make me choose? Information is power, so my little group explored the venue thoroughly. Tobacco dock made a charming location - although open to the elements, there were enough enclosed spaces to hide should it rain (which, luckily, it didn't). Most of the chefs were arranged over the two floors of the old docks themselves, and those chefs with special requirements were outside - the whole roast ox, for example, or the huge barbecue pit full of succulent goat. There were also plenty of bars and almost enough places to sit. Agonising though it was, choices were eventually made. Most of us have had one sublime festival moment. Many of my generation go misty eyed at the mention of Orbital on the Pyramid Stage, Glastonbury, 1994. 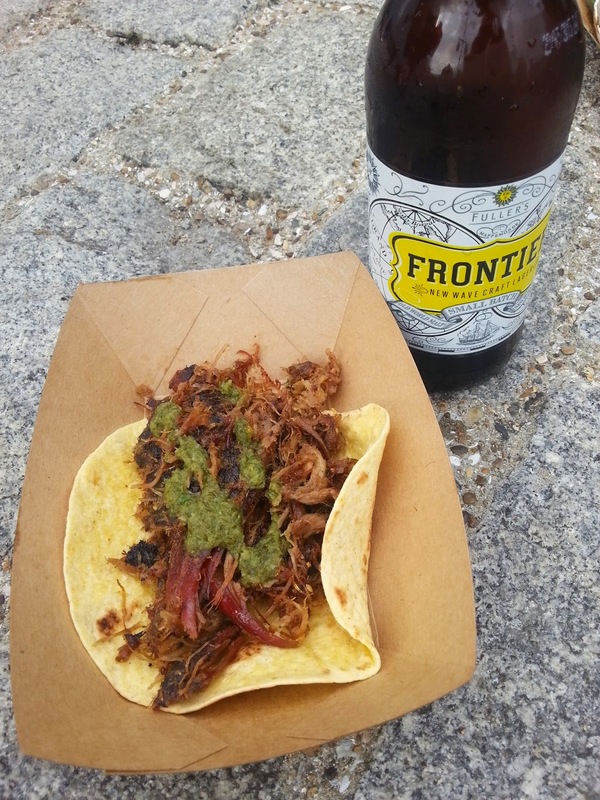 Did I have such a moment at Meatopia? I think the closest I got was my opening dish - the brisket by Tim Rattray of San Antonio's Granary Cue and Brew where I'd eaten just last month. 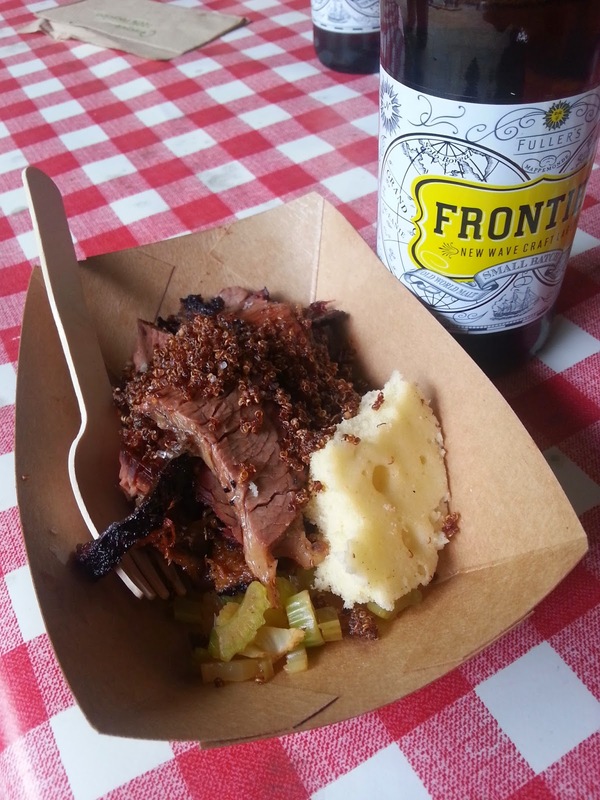 Oh, I've missed brisket, and this was as good as any I'd had in Texas. I couldn't fault my other plates either - Neil Rankin's goat tacos were incredible, and I'm definitely putting the Smokehouse in Islington on my must try list. Siggi Gunnlaugsson's burger with comte cheese was just as good - I walked past their place on Marylebone recently and thought it looked it good. They're definitely on the list too. Actually, let's also put 'Q Grill' on the list, as their pig cheeks just melted in my mouth. I must also give honorable mentions to Hawksmoor (my daughter loved their flat iron steak), to Lockhart for the enormous chunk of chicken they gave my wife and finally a special prize for Bristol's Grillstock for their tray of 'free meat' - offcuts of their delicious rump hearts that kept us walking past their counter again and again and again (and convinced my daughter to eat their dish too). So would we go again? Hell yes, it's in the diary already. Could I have eaten more food? Oh yes, that too - I was high on barbecue by the time I left, and had to be nearly dragged out by my friends and family. 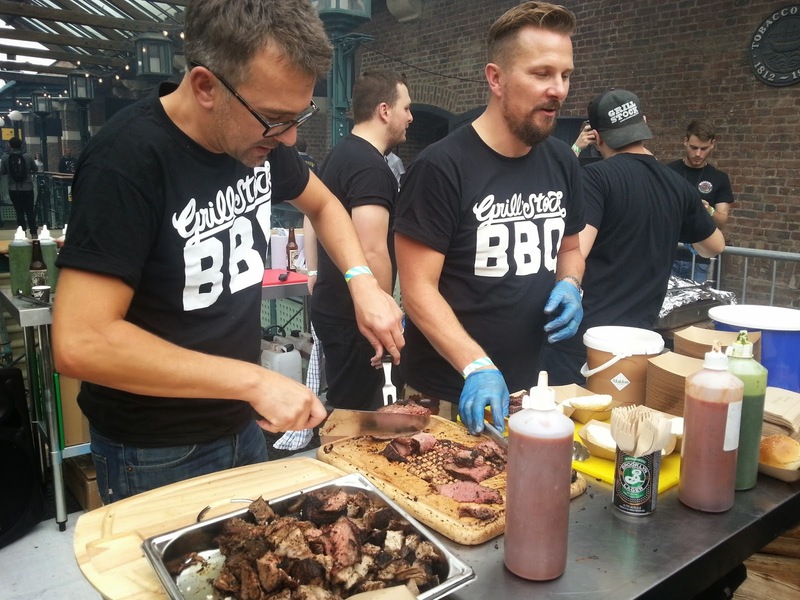 Meatopia - you're my kind of festival! Who's in the market for chorizo in a bun?